NASCAR is a sport in which wins and losses are the ultimate declaration of greatness. Other sports such as baseball, football, and basketball measure greatness in other statistical ways. Yet, NASCAR doesn’t offer fans and pundits the same wiggle room to make claims of distinction. Motorsports fans can use betting mobile applications to get up to the minute odds and bonuses for this year’s NASCAR season. 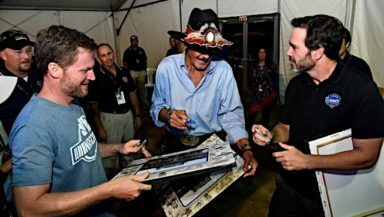 While baseball writers and insiders continue to devise new ways to weigh a player’s influence, NASCAR is unique in its black and white statistics. Here is Speedway Media’s top 5 NASCAR drivers of all-time. Cale Yarborough rose to racing fame in the 1970s, but he had already been driving for over 10 years by the time he found consistent Winston Cup Racing success. The driver won his first race in 1965. By the end of the 1970s, Yarborough had won three consecutive NASCAR championships. That three-year span saw Yarborough capture 28 race wins. In all, he was victorious 83 times. Yarborough retired after the 1988 season, bringing to an end a career that spanned four decades. Jimmie Johnson is tied for the most Monster Energy NASCAR Cup Series championships. Five of the seven championship came in consecutive years, giving Johnson and incredible dynasty that is the measuring stick for all drivers today. The California-native won all seven of his titles between 2006 and 2016. Johnson has 83 career Monster Energy NASCAR Cup Series wins. Jeff Gordon retired in 2015 after amassing a 22-year career. Despite being a constant winner, Gordon was often a divisive driver due to his pretty-boy good looks and personality. Despite some fans never taking to Gordon, he won 93 races making him the leader in career wins in the modern era. He also tallied four cup championships and became the first NASCAR driver to reach the $100 million mark. Gordon was one of the drivers that helped take NASCAR into the 1990s and 2000s. Dale Earnhardt was one of the first – if not the first – NASCAR driver to crossover into mainstream culture. Known as “The Intimidator” for his driving style, Earnhardt was a superstar in a sport that was regionalized until the 1990s. Earnhardt won seven Winston Cup Championships. In 2001, Earnhardt died at the Daytona 500 marking one of the most publicized deaths in motorsports history. “The Intimidator’s” career may have been cut short, but he still registered 428 top ten finishes and 281 top five finishes in 676 races. Richard Petty raced to 200 career NASCAR wins. His performances on the race track earned him the nickname “The King” as he become the first superstar of the sport. Petty won seven Daytona 500 races along with five Winston Cup Series Championships. All five came between 1971 and 1979. Petty’s iconic black cowboy hat, sunglasses, and mustache are one of the most memorable images of NASCAR in the 1970s and 1980s. For those who are interested in the sport of racing but not limited to NASCAR, this source has an extensive database of both historical content as well as predictions.